The stage was set for what was billed as one of the biggest games in this series as it featured both the 2012 and 2013 College Basketball National Champions competing against each other in the Sweet 16. Our Cardinals led most of the way, but It was a pretty competitive game throughout. I think the script went a different way than what most of us expected. Kentucky was supposed to be the young team that lost focus down the stretch especially with one of their best defenders in the locker room. But that’s not what happen. It was our veteran Cardinals that started taking bad shots, making bad decisions, and struggled to put the ball in the basket in the final minutes of the game. In the final eight minutes of the game, Louisville scored two points in the paint on 1-of-5 shooting and scored just three points in the final three minutes. 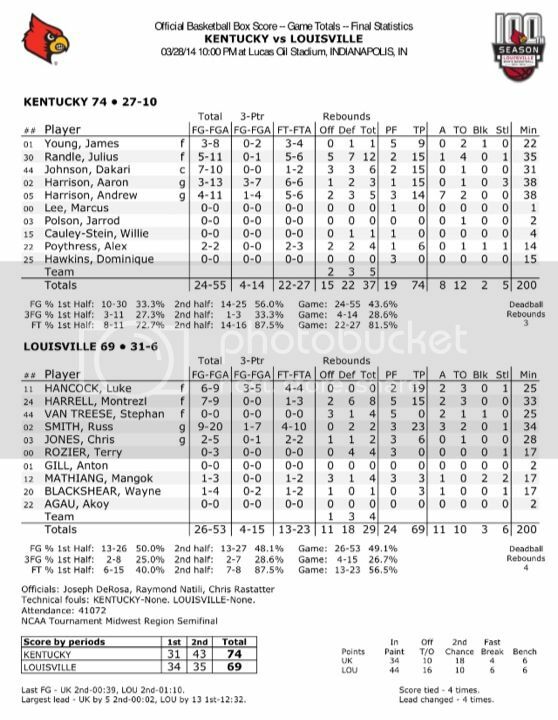 The Cardinals missed 10 of their 23 free throws while Kentucky was 22 of 27 at the line, and made five of its last six. Our Cards also got beat up on the boards 37-29 and that led to 8 second chance points. These stats are what sealed the victory for the Wildcats. Luke with 19 points, Russ with 23 points, Montrezl with 15 points, 8 rebounds Stephan with his hustle/effort and Chris with 6 points all went down swinging. These starters and especially our seniors left their hearts on the floor Friday night and gave it all they had like they’ve done so many times in the past. I was also very impressed with Mango who had 4 rebounds, 3 points, and 2 blocked shots. I am extremely optimistic about this kids future. His play has been trending upward all season and I’m looking forward to seeing what’s in store next season. Wayne’s struggles continue and my comments about him are starting to be like a broken record. He played 17 minutes and had 1 rebound, 3 points, 1 assist and 1 steal. He started his Cardinal career as one of the most anticipated players ever and will now head into his senior season with very minimal expectations. Great kid but don’t know if he’ll ever get it figured out again. This week we have flown our flags a little higher and wore our gear with that little extra boost of pride. This is the Cards and the Cats and it just doesn’t get any bigger in college basketball. This year’s Sweet 16 round of the NCAA Tournament will feature the 2012 and 2013 National Champions, and will be a rubber match of sorts between the last two champs of college basketball. The game will also feature programs with very different approaches to winning. The college basketball world will be watching to see if the team of grizzled veterans or the team of super freshman phenoms will rule the day. Lucas Oil Stadium will be rocking Friday night and this will be the most anticipated Battle of the Bluegrass in years. It has been the Cats who have won the last 8 out of eleven in this battle head-to-head, but when looking at their entire body of work these teams have had similar success in the last 30 years. A series that started in 1913 these old rivals will meet for the 47th time on Friday night and for the 6th time in the NCAA Tournament. 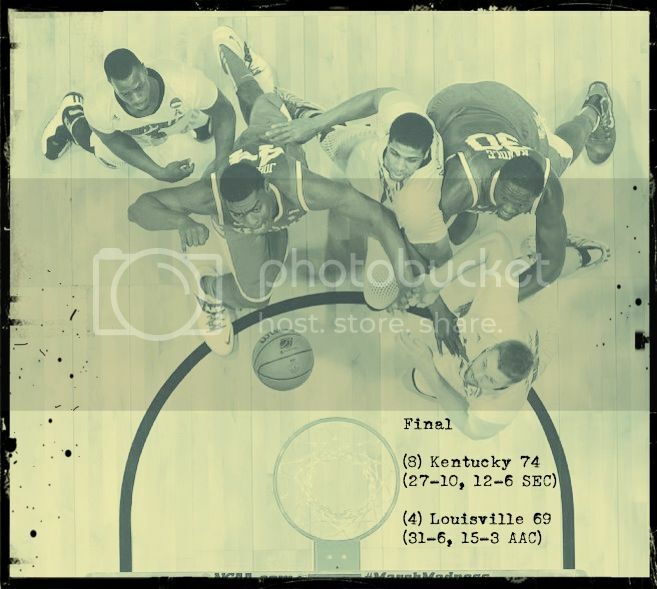 Kentucky holds the all-time lead in this series 31-15, (3-2 in NCAA). Once again, Kentucky started from scratch this season after losing a host of players to the NBA and transfer. The Wildcats started this season ranked number #1 in the country despite returning only two players who contributed to their NIT first round loss last season. That says a lot about their coach John Calipari and his success in recruiting the best. As they have done since Calipari arrived on campus, the Cats once again have many blue chip athletes leading their team and many have dubbed this year’s UK freshman class as the best ever. This team does not compare to any team that Calipari has had since he’s been in Lexington, and he doesn’t have that group of upperclassman that can contribute on a nightly basis. He will start 5 freshman Friday night. This group of UK freshman had been struggling to find their mojo. That resulted in a 9 loss regular season and a tumultuous plunge in the national rankings becoming one of only a few teams to start the season ranked 1st and finish unranked. Kentucky had suffered from defensive lapses against better teams. 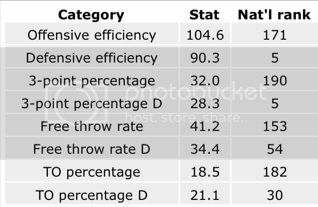 In their 9 losses, they allowed teams to be offensively efficient and shoot a high effective FG%. They could not score consistently, because they did not communicate, share the ball and play solid basketball. In the post season all that has changed. They are now playing more consistent on the defensive end of the floor and playing more like a team on the offensive end. In the Ken Pom ratings they currently have a 116.0 Offensive Adjustment efficiency ranked 17th and 96.0 Defensive Adjustment efficiency ranked 25th. -Among his top 7 Rim Protectors he has UK’s Willie Cauley Stein ranked 2nd with a 12.2 Block% and UofL’s Mango Mathiang ranked 5th with a 9.9 Block%. -Among his top 16 players who rely on offensive rebounds to score due to their limited offensive skills he has UK’s Dakari Johnson ranked 2nd with a 17.5 offensive rebound%, UofL’s Stephan Van Treese ranked 4th with a 13.8 offensive rebound%, and UK’s Alex Poythress ranked 10th with a 11.6 offensive rebound%. Not mentioned by Dan in his research, but important to note that Van Treese has 43 rebounds in his last five games. -Among his top 26 scorers he has Luke Hancock ranked 6th shooting 34% from the 3 point line (65 made, 192 attempted), and has Wayne Blackshear ranked 17th shooting 40% from the 3 point line (45 made, 112 attempted). Dan also mentions Luke and Wayne don’t just fit into one category. Mentioning Luke’s ability to drive to the basket and get fouled. And mentioning Wayne being a versatile defender. No UK players made this list. -Among his top 13 pass first point guards he has Terry Rozier ranked 12th with a 116.9 offensive rating, 17.0 assist%, and 3.0 assist/turnover ratio. No UK players are listed in this category. -Among his top 7 players when it comes to passing and scoring he has UK’s Andrew Harrison ranked 4th (11 PPG, 21.7 PctPoss, 104 ORtg, 23.1 A%, 1.4 A/To), and has UofL’s Chris Jones ranked 6th (10.4 PPG, 21.7 PctPoss, 110.2 ORtg, 20.6 A%, 2.1 A/To). He also mentions Harrison’s ability to drive and get to the lane. -Among his top 19 pure scorers he has UofL’s Montrezl Harrell ranked 5th (14 PPG, 69.1 Tempo, 72.9 PctMin, 22.1 PctPoss, 117.6 ORtg), UK’s Aaron Harrison ranked 7th (14.1 PPG, 66.5 Tempo, 79.7 PctMin, 20.7 PctPoss, 116.6 ORtg), UofL’s Russ Smith ranked 10th (18.1 PPG, 69.1 Tempo, 72.9 PctMin, 30.8 PctMin, 30.8 PctPoss, 114.5 ORtg), UK’s Julius Randle ranked 15th (15.1 PPG, 66.5 Tempo, 75.9 PctMin, 26.3 PctPoss, 111.2 ORtg), and UK’s James Young ranked 17th (14.3 PPG, 66.5 Tempo, 80.1 PctMin, 22.0 PctPoss, 110.4 ORtg). The Cardinals come into this game having a more consistent and effective back-court while Kentucky has the more consistent and effective front-court. In college basketball guard play is crucial to a team’s success rate especially in the NCAA Tournament. The speed of Russ Smith and Chris Jones is going to be very difficult for the bigger Kentucky guards to stay in front of. I really think they win that battle. More importantly in this one is if Montrezl, Stephan, and Mango can somehow neutralize the play of Cauley-Stein, Poythress and Randle. The winner of that three spot battle between Young, Blackshear and Hancock will also be a huge factor in this game. Coach Pitino has had these guys away from all of the hype all week. He will have them ready to go. It will just come down to the execution of the game plan. Our Cards aren’t far removed from the biggest stage in college basketball, so the game on Saturday should be a walk in the park for our veterans. All the pressure is on the young guys in blue. Their room for error has been and will be very narrow in this game. I think it will all be too much for them to handle. I’m ready to stop reading and talking about this game. I’m ready to head to Indy and watch what will be another great chapter in this rivalry. I do think this will be an incredible game and it will come down to the smallest intangibles that will make the difference. I like our Cardinals in this game and think they’ll be headed to the Elite 8 on Sunday and Coach Pitino will be 12-0 in the Sweet 16. Go Cards!. Is It Still A Dream? Here we go again folks. Once again the NCAA Committee has set up the brackets so that The University of Kentucky and The University of Louisville will face each other in the NCAA Tournament. This will be the second time in the last three years that these bitter rivals will do battle in the post season. In 2012 it was the Final Four and this time the Sweet 16 will be the battle ground for the Bluegrass’s modern version of a Civil War. We have called these meetings in the past “The Dream Game”. Is it still a dream? The original “Dream Game” happened in the 1983 NCAA Tournament. 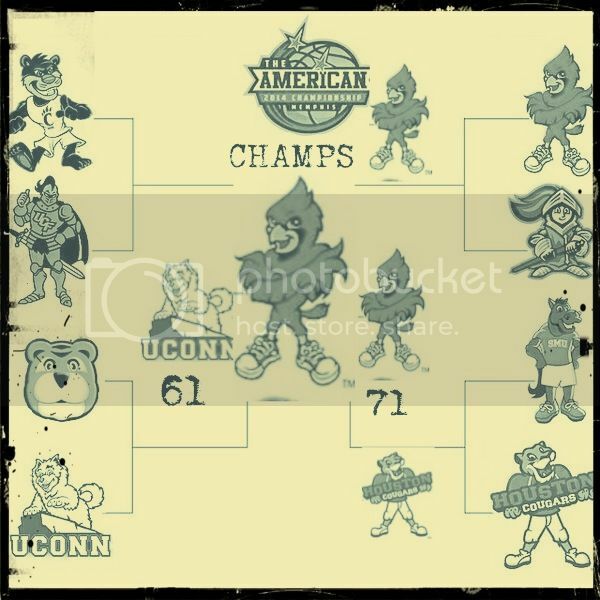 That year Louisville defeated Kentucky 80-68 in the Mid East Regional Final. The game took place in Knoxville Tennessee. I wasn’t old enough to appreciate that game, so in 2012 I vowed that I would take full advantage of the moment. I wore my colors proudly all week. 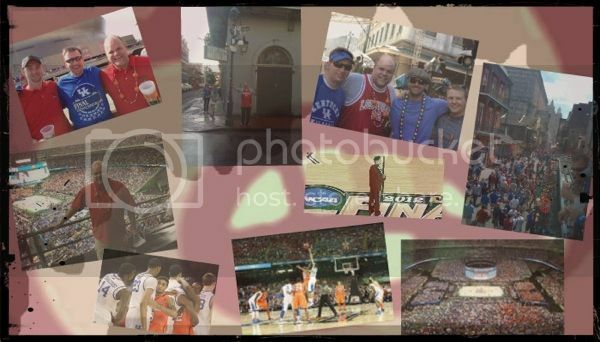 Then loaded up and headed to the Big Easy with a group of guys I had grown up arguing this rivalry with. One side of the car had a blue flag and the other side had a red one. When we reached Tennessee we stopped at a local restaurant for a meal. We walked in decked out in our colors and sat at the bar. Some of the local patrons asked if we were headed to the big game and then asked how we could all be friends while cheering for opposite teams. We explained to them about how that made this rivalry so special, and this game so big. We reached New Orleans early Saturday morning and had an awesome time that day partaking in the festivities of the French Quarter. While there we met up with other friends and family to celebrate our teams’ achievements. Later that night we would attend the Final Four version of the Dream Game. 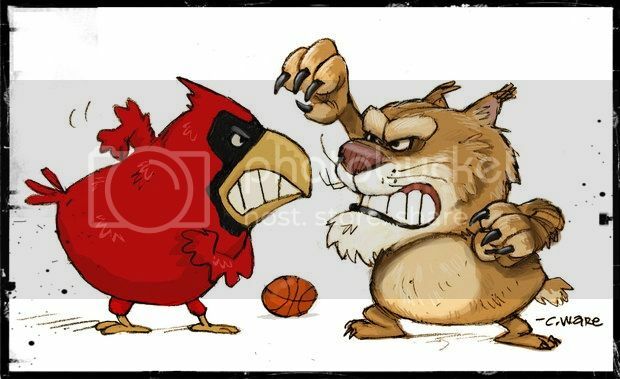 My Cardinals gave a valiant effort and came up short against the arch rival Cats losing the game 69-61. But on this night and on this weekend in March I didn’t feel like there were any losers. It was just an awesome time to be a college basketball fan in the state of Kentucky. This time it’s much different. When the brackets were reveled on selection Sunday and I seen the possibility of a potential Sweet 16 match-up with Kentucky I didn’t feel any type of excitement or jubilation. This past weekend when both teams advanced to the round of sixteen I didn’t feel excited about playing our arch rival again and if I’m being honest it really put a damper on the whole post season for me. I will be heading to Indianapolis on Friday afternoon, but this time I won’t be with my friends that cheer for Kentucky and this time there won’t be any meeting up for pre-game pleasantries. I will be with Louisville fans from beginning to end. Maybe in 2012 knowing that both teams had won a regional championship and made it to the Final Four there was a sense of accomplishment without having to worry about who would win the game. Maybe I was just so thankful that our Cardinals had made it to the Final Four that year I didn’t even care about advancing any further. Or maybe this rivalry has become so hate filled, so vitriolic that it’s just not that much fun anymore. I never thought I’d see the day where I didn’t love the rivalry between UK and UofL. I have defended it so many times to those who have claimed that they didn’t want to play it. I have been to 20 games between the Cardinals and the Cats. I used to look forward to this game more than any on the schedule, but something has changed. Back in December I was given the opportunity to watch the premiere of the Red vs. Blue movie. It was a fun night that I shared with my brother and his sons. They are UK fans and we’ve always had a good time with it. But attending the game in Rupp the next day didn’t make me feel the excitement it had in years past. I don’t know what has happened to my passion for this game and this rivalry. Maybe I’ve outgrown it, and for the first time in my adult life I think I could live without it. I do think it’s the greatest rivalry in college basketball and I’ll continue to give it the proper respect it deserves. But if there ever comes a day when it comes to an end I don’t think I’ll miss it. It’s been anything but sweet over the last couple of days in Orlando, but nonetheless our Cards are headed to their third straight appearance in the Sweet 16 and 20th overall after beating St Louis 66-51. With the win the Cards have won seven straight and eight straight in the NCAA Tournament. And they have now won 67 straight games when leading at half time. Louisville is just the fourth reigning title winner to win a game by 15 points since the tournament expanded in 1985. Each of the previous 3 teams reached the Final Four. This win today wasn’t that pretty from a viewing standpoint, but big picture it was a great victory. This is the worst loss that St Louis has had all season. Even with the offensive struggle Chris, Montrezl, Russ and Luke all had double digit scoring. Luke was the most clutch performer of the group hitting several timely three point shots at key moments in the game. He finished with 21 points and has been the answer to the Cards shooting woes for the last two games. He’s picked right up where he left off in Atlanta last year in terms of stepping up for this team. Luke has scored 79 points (14 3-pointers) in his last 4 NCAA Tournament games. There wasn’t much available in the paint today but Montrezl battled his way to 10 points, but it was his work on the boards grabbing 11 rebounds that had the biggest impact on the Cards win. His rebounding effort has been a difference maker in the first two rounds grabbing 24 total in two games. Gotta give credit to Stephan, Wayne, Mango and Terry for giving the Cardinals some good minutes off the bench in these last two tough games. Stephan said after the game that Coach Pitino called him “The Eraser”. Very fitting because he does erase mistakes with his all out hustle. Wayne had 6 points today and has provided some spark when he has played. Thats good to see and could be huge down the stretch. Mango seems to be gaining more and more confidence with every minute he plays. He’s had 3 blocked shots in the last two games. Terry has also had some timely rebounds, assist, steals and points in the past two games. The Cards got 11 points from their bench today off 5-5 shooting. Our Cardinals will now head to Indy for their 20th Sweet 16 appearance. It is 5th-most in college hoops since 1975. And they have been to at least the Sweet 16 in 6 of the last 10 years. But as Russ reminded us after the game today: “Sweet 16 is nice, but we don’t celebrate Sweet 16s in this program.” Things get real now as they are 4 games away from another National Title and just two away from another Final Four. I am ready for next Friday and if you can be there I encourage you to get some tickets. Cardinal Nation is going to take over Luuuuuke Oil Stadium. Go Cards! 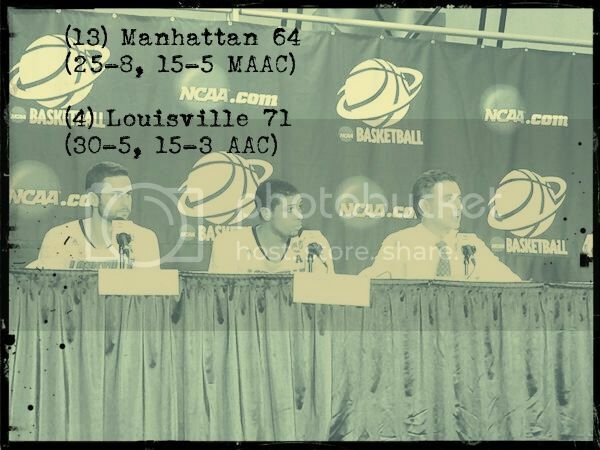 The madness rolls on for our Louisville Cardinals after they survived a tough first round game against Manhattan. 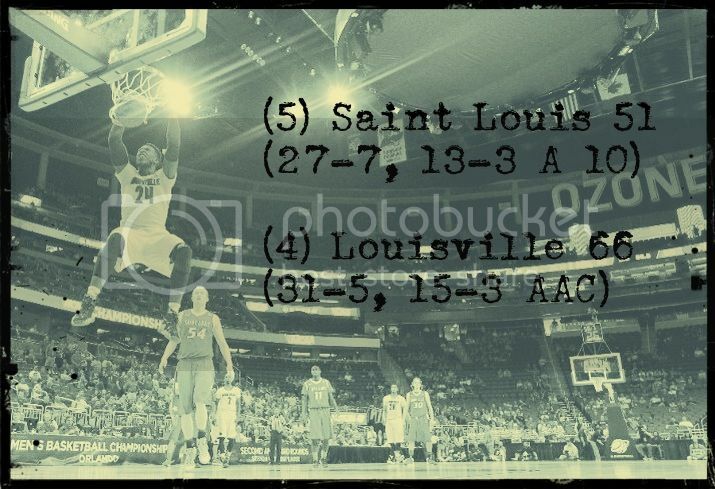 Up next is the St Louis Billikens from the Atlantic 10 Conference. They beat NC State in overtime to advance in the tournament. St Louis is making its third straight appearance in the Tournament and their ninth overall. They will be looking to get to the Sweet 16 for the first time in school history. The Cardinals are looking to make their third straight appearance in the Sweet 16 and 20th overall. 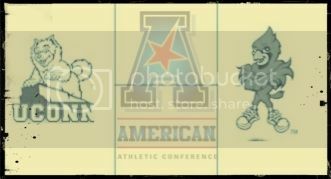 These teams do have a history that dates back to 1920, and have faced each other as members of the Missouri Valley, Metro and Conference USA. The Cardinals lead the overall series 45-20. This St Louis team is defined by its play on the defensive end of the floor. They have maybe the best man-to-man defense in the country holding teams to 44% from the field and they also guard well from beyond the arc holding teams to 28% from 3 point range. This is a team like our Cardinals who pride themselves in shutting down their opponents. On offense this team is very deliberate in their approach. They feed off of the defense’s turnovers and they will run multiple sets using most of the shot clock on every possession. They use so many offensive plays that Coach Pitino said that they are a nightmare to prepare for on short notice. Like the Cardinals they are led by a group of seniors who are the winningest group in school history. 5 of those seniors lead a balanced offensive attack: Dwayne Evans (13.9 ppg, 6.4 rpg, 1.3 apg), Jordair Jett (13.8 ppg, 4.0 rpg, 4.8 apg), Rob Loe (10.3 ppg, 5.7 rpg, 2.0 apg), Mike McCall Jr. (10.0 ppg, 3.9 rpg, 2.4 apg), and Jake Barnett (4.8 ppg, 2.8 rpg, 1.2 apg). Jett and Evans are very important on offense and create most of the opportunities for this team to score. Jett has lightning speed, quick hands and can penetrate the lane quick if not closed out. Rob Loe is a 7-footer that creates a matchup nightmare for opposing defenders because of his ability to step away from the basket and knock down the outside shot. There are no easy games this time of the year as our Cardinals found out in their opening round. This one is not going to be an easy one. After a very tough and physical game against the Jasper’s our guys are feeling the effects. Russ Smith told the media on Friday afternoon that his body was in shambles. He has a badly sprained thumb that will be taped up on Saturday. Due to the game ending so late up in the morning the team is also feeling the effects. Chris Jones told the media on Friday that he didn’t get to sleep until 4am. With another very tough defense ahead of them our guys are going to have to dig deep to find that extra gear. St Louis’s grind it out style will be brutal to a tired team. In all of the Billikens’ losses this season their opponents had a low turnover rate and kept them in check on the offensive end of the floor. The Cardinals will have to make the most of their possessions on Saturday and limit their turnovers. They will also have to shoot a decent percentage if they want to move on to Indy. I really think our bench is going to have to have a big impact in this one and Montrezl, Van Treese, and Mango are going to have to own the paint. Will also be interesting to see who will have the task of keeping up with Loe. I do think our Cards will move on to the Sweet 16, but under the circumstances this one is going to be the toughest game of the entire season. It really could come down to the last few possessions. These are two very proud veteran ball teams with the winningest seniors in all of college basketball. Get ready to be on the edge of your seats again folks. 5 to go! Go Cardinals! Was that game March Madness enough for you? It’s about surviving and advancing during this time of the year. The Cardinals did survive a gutsy performance by Steve Masiello’s Jasper’s winning 71-64. Last year the Cardinals had their survive moment in the Final Four when they had to squeak out a win over Wichita State. Hopefully we won’t have any more close calls and can use the experience gained in this game tonight as a spring board the rest of the way. With the win tonight Louisville has now achieved its 8th 30-win season in school history, and won 7 straight games in the NCAA Tourney. The Jasper’s were able to hang around in this game because they played some excellent defense and held the Cards to 36.5% from the field, 30.8% from the 3 point line and forced 12 turnovers. In my opinion Louisville won’t get another defensive effort like these guys thrown at them tonight. It is also important to note that Russ became the all-time steals leader at Louisville with his two tonight. He has 256 for his career. Games like this do make teams tougher. The Cardinals learned more about themselves tonight than they have in the last month in my opinion. Sometimes it takes more than athleticism and talent. Sometimes it takes grit and determination, and that’s what our guys showed tonight. We should all be proud of how they pulled it out. One down and five more to go Cardinal fans. Next up is St Louis at around 2:45 pm on Saturday. We can now take a day off and enjoy tomorrow our guys survived and advanced. Go Cards! We are less than 24 hours from getting to watch our Cards defend their National Title. The Cardinals will start their march towards Dallas with a first round match-up with Manhattan College who earned a #13 seed in the Midwest after securing the automatic bid out of the Metro Atlantic Athletic Conference (MAAC). Both the Cardinals and the Jasper’s have won 11 of their last 12 games. Both of these teams come into the NCAA Tournament winning their last 5 games. The Jaspers are in the NCAA Tournament for the seventh time and the first time since 2004, when Manhattan advanced to the round of 32 as a #12 seed. The Jaspers have won their first-round game in two of their last three appearances in the NCAA Tournament. The Cardinals hold the overall lead in this series 6-2 including a 79-51 win the last time these teams played back in 2012. Former Pitino assistant Coach Steve Masiello has done a remarkable job in just a few seasons at Manhattan and has brought a winning culture back to that program. His coaching resembles that of his former boss and his team is pretty much a mirror image of the Cardinals offense and defense. Like the Cardinals their defensive pressure has been their signature all season long. They apply a suffocating half-court defense, trying to force opponents into turnovers and poor shots. Manhattan ranks 16th in the country in turnover percentage defense (22.1 percent) leading to many fast-break opportunities. Even though they will run a similar style offense they don’t exactly have the same offensive weapons as the Cardinals. Their team isn’t exceptionally athletic or talented offensively. 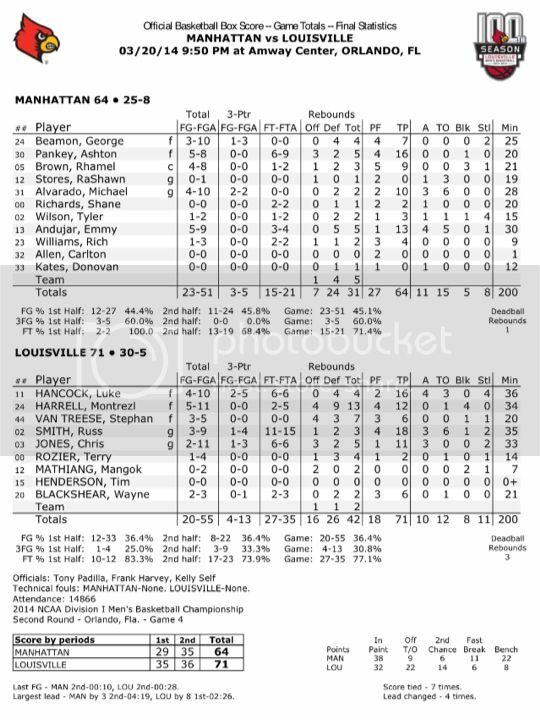 Like most low-majors, Manhattan will be undersized against high-major foe Louisville. The guys leading the way on the offensive end for the Jasper’s is Rhamel Brown (10.1 ppg, 6.0 rpg, 0.7 apg), Ashton Pankey (6.8 ppg, 4.3 rpg, 0.2 apg), George Beamon (19.2 ppg, 6.6 rpg, 0.8 apg), RaShawn Stores (5.1 ppg, 2.1 rpg, 2.0 apg), Michael Alvarado (12.0 ppg, 2.8 rpg, 4.0 apg), and Shane Richards (8.5 ppg, 1.8 rpg, 0.7 apg). George Beamon is their best player and he can fill it up if he gets going. A long and bouncy athlete (6-foot-4), Beamon has scored 20 or more points 17 times this season and excels at hitting 15-foot jumpers and 3-pointers when left alone in transition. Manhattan shoots 36.7 percent from beyond the arc and Shane Richards is their most explosive, yet inconsistent threat off the bench. A 41-percent 3-point shooter, Richards scored 14 points to help Manhattan down Iona. Manhattan has a decent ball team, and it really is bad luck for Steve Masiello to have to open up against his mentor. His team relies on forcing the opponent into turning the ball over at a high rate and his team loves to put pressure on opposing guards to force them into mistakes. That’s not going to happen Thursday night. The last time these teams played Russ Smith led the Cardinals scoring 23 points on 8-18 shooting and making 4 of 13 from the 3 point line. Smith was also disruptive on the defensive end, with five steals. It will be much the same on Thursday night. Montrezl will also have his way in the front court against a much less physical Manhattan. The Cardinals have too many athletes and too much experience for the Jasper’s to handle. This one isn’t going to be close and Coach Pitino should be able to use his bench in order to rest the guys for a much tougher opponent in the second round. The wait is almost over Cardinal fans. I’m ready to stop hearing everyone talk about it and ready to see all these teams go at it. I’m looking forward to the most exciting sports day of the year. Go Cards! Our Cardinals are AAC Champions after beating the Huskies 71-61 in the AAC Tournament. This is the fifth straight win over the Huskies and we end the series with them for the foreseeable future as Louisville is now ACC bound. The win tonight gives the Cardinals their 40th NCAA Tourney birth, three straight league tournament titles, and they have won 19 of their past 20 post-season games. All of this to go with their share of the regular-season title with Cincinnati. This season has been another remarkable one, and now it’s time to go win six more in the next couple of weeks. As expected UCONN played a pretty solid game, but just couldn’t overcome the 14 point lead the Cards built in the first half. It’s a tall task to do that against the Cardinals defense. The Cardinals forced 13 turnovers and scored 13 off of those turnovers. They had 8 steals and held the Huskies to 25% three point shooting and 44% Field goal shooting. The Cardinals kept constant pressure on their back-court and made it hard for them to get anything consistent going. Another very positive stat was that the Cardinals out-rebounded the Huskies 38-33 after being beat up on the boards last night. Montrezl Harrell finished off his AAC tourney with a monster outing getting his tenth double-double of the year and earning a spot on the all-tourney team. He had 22 points, 11 rebounds and three blocked shots. You can’t say enough about the progression of this kid over the last 3 or 4 months, and the writing was pretty much on the wall after he had such a great off season winning his gold medal. Folks that saw him in the summer predicted the kind of year he has had and they were right on the money. He has flourished in Rick’s system and now it’s time for him to help the Cards get #4. Russ Smith had another great showing as well scoring 19 points with 3 assist and 5 steals. He was the tournaments most outstanding player. After the performance tonight he is 10th overall in assist for a season, top 5 in scoring and ties Peyton Siva for the all-time steals lead. We are some lucky folks to be witness to the Russ phenomenon. Players like him only happen once a lifetime and we now have our Tyra, Unseld, Griffith, Ellison. We will see that #2 hoisted to the rafters someday. Can’t wait to see what he pulls off in the NCAA Tourney. Luke Hancock had 4 points, 3 rebounds and 1 assist and while that performance doesn’t jump off the page at you it’s his leadership that stood out in this one. A reporter at the game overheard Luke telling Terry to “calm down and be serious” when the young fella was being a little goofy before the game. When ask about the nets after the game Luke responded: “I walked right by them. We didn’t do it last year until the end and we’re not doing it this year.” Cool hand Luke! Chris Jones who earned a spot on the all tourney team had a good night in his home town scoring 11 points and 4 rebounds. He is playing well and has adapted very nicely in his role on this team heading into the NCAA Tourney. I’ve gotta give mention to Mr Hustle Stephan Van Treese for his 8 rebounds, 3 assist and 2 steals. At one point we were up 20 and he was diving on the floor for a loose ball. He brings so much to the table that goes unnoticed. Having a kid like this on your team come Tourney time is huge. And last but certainly not least is our fab freshman Terry Rozier who showed some moxie tonight with some great plays. He had 7 points. I have a feeling that he will replace Russ as a fan favorite next season. He’s got a huge upside and he’s itching to get his moment. Now we celebrate and enjoy another great Cardinal Basketball achievement. It’s been an awesome run and we’ll find out tomorrow evening what the road will look like for this team to go after #4. There’s a lot of talk about seeding, but I don’t think that matters much when a team is focused and tuned in. To be the best you have to beat the best. Last season we had a 1 seed, but played probably 5 of the best teams to win a title. So I say bring it on! Ready for the Madness to begin. Go Cards! It’s going to be a battle for the AAC tournament title tonight, but it’s going to have a Big East feel as the Huskies and Cards lock up one last time. Usually this story would have played out in front of a packed Madison Square Garden on a Saturday Night, but tonight the story will end in Memphis and it’s hard to say what the crowd will be like since they have been thin all week. The Cardinals lead this series 10-6 and have won four straight against the Huskies including that 33 point drubbing on senior day last weekend. 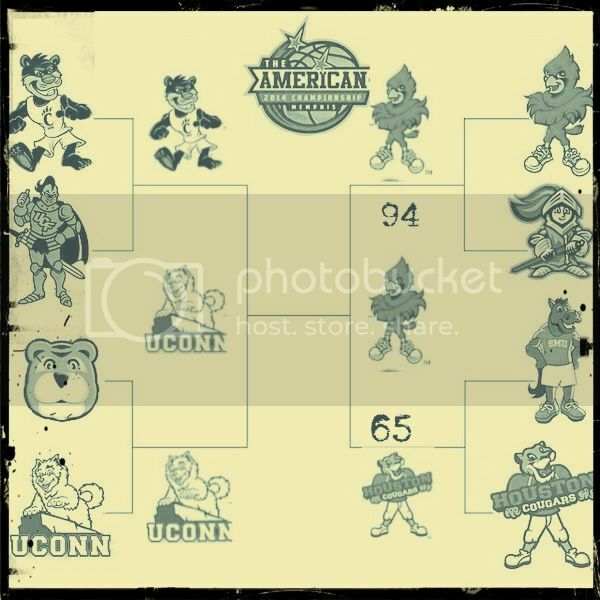 After a year of sitting out of post season play UCONN is one of the hungriest teams in college basketball right now looking forward to getting their chance at a deep NCAA run. Coach Kevin Ollie did an excellent job keeping his team playing hard last year, and this season has been no different. They could have folded their tents after that beat down in Louisville last weekend, but they have now beat the host team Memphis and top seeded UC to make the AAC final. Their backcourt is experienced, talented and one of the best in the country. They are lead by All-American candidate Shabazz Napier (18.1 ppg, 5.9 rpg, 5.3 apg), Ryan Boatright (12.2 ppg, 3.4 rpg, 3.5 apg) and Omar Calhoun (4.5 ppg, 1.6 rpg, 0.3 apg) all can pressure the ball, are competitive, play with confidence and have the ability to score. They are also getting quality minutes from DeAndre Daniels (12.1 ppg, 5.5 rpg, 0.4 apg), Niels Giffey (8.2 ppg, 3.4 rpg, 0.5 blkpg) and Lasan Kromah (7.1 ppg, 3.0 rpg, 0.4 blkpg). Taken together, the Huskies’ big three of Napier, Boatright and DeAndre Daniels are shooting around 44 percent inside the arc and around 45 percent outside it this season. Napier is everything for this team. He leads the team in every offensive category, steals, and even rebounds. He averages 17.8 points a game, and he makes his team better. DaAndre Daniels and Ryan Boatright both average over 12 points per game. The Huskies are also playing some pretty good defense this week holding Memphis to 26.4% from the field and holding UC to 43.9%. Daniels and Amida Brimah are both in the top five of the conference in blocked shots. They had 4 against the Tigers and 6 against the Bearcats. These guys make the Huskies a scary team down low. The key for them in their last two wins is that they have played more like a team, and not relied on Napier as much as they had been. It has been more of a team effort. The Cardinals will get the Huskies best effort tonight. You best believe that they wanted this rematch. Our Cards have had an easier road to the AAC title game, but there will be nothing easy about this game tonight. The Cards biggest strengths to this point has been their ability to score and stop their opponents from scoring. It will have to be par for the course tonight. They lead the conference in points per game at 81.8. Russ Smith is coming off his monster game last night and we have four players averaging double figures. I would think that the scoring tonight will have to be distributed and more balanced. 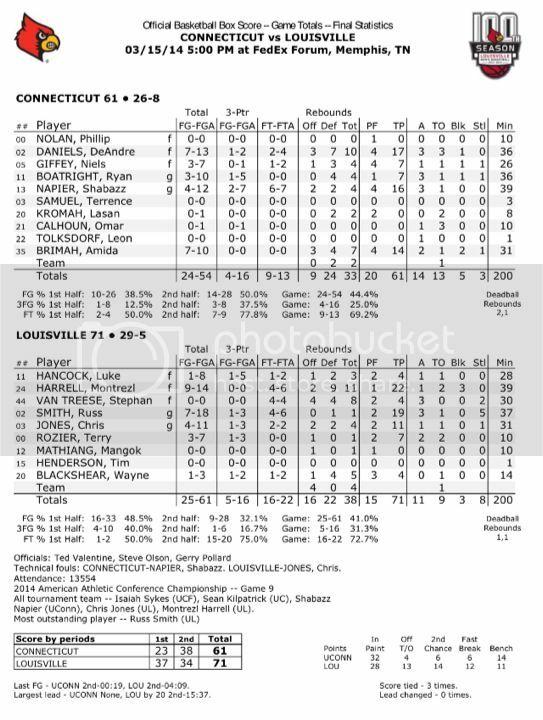 I look for a surprise game from Wayne Blackshear and just maybe Terry Rozier. I think Chris Jones will also have a big outing in his curtain call in his hometown. Taking care of the ball tonight will also be crucial. The defense will need to have another big night and force them to get the ball in the hands of their guys that don’t handle it well. UCONN is a very good offensive team and the Cards will need to repeat their shut down performance of the Huskies last weekend. The Cards got brutalized on the boards last night, and that can’t happen tonight. Montrezl Harrell is second in the conference in rebounds per game, but last night only had 5. He has to do better in this title game. With all that said you can throw all logic, stats, and records out the window for this one. It’s the AAC title game. A lot of pride is on the line for these two very proud programs. Don’t think for one second that the guys leading these two teams Russ and Napier don’t want to go out on top. This should be a great game and a fun one to watch. I think our Cards win a close one down the stretch. Our defense will be too much and the Huskies will eventually buckle under the pressure. I’m looking forward to this game! Go Cards! Louisville will advance to their 4th consecutive conference final and will be looking to win their 3rd conference championship in a row after eliminating Houston 94-65 in the AAC semi-finals tonight. The Cards came into the AAC Tournament leading the nation in win margin. The last 2 games didn’t hurt that beating Rutgers by 61, and Houston by 29. They have outscored their last three opponents by 123 Pts, and have 19 wins by 20+ points this season. No other team has more than 14. It was another great defensive effort tonight and it didn’t take long for the pressure to start to take its toll on the Cougars. 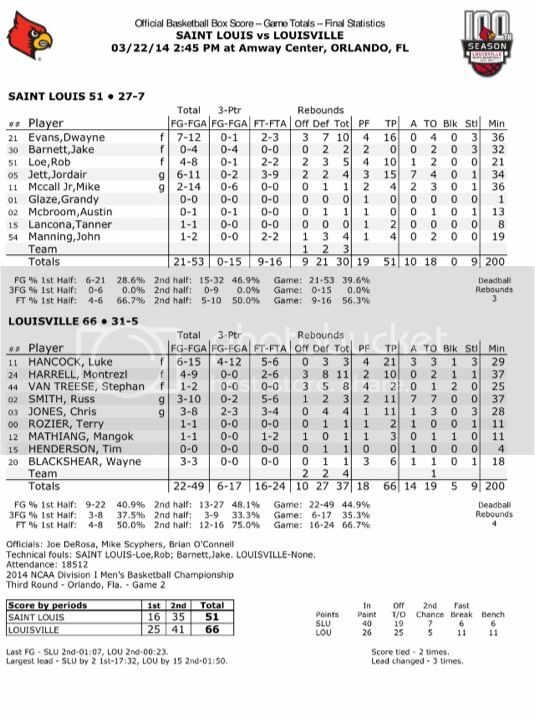 The Cards forced them into 16 turnovers scoring 20+ points off of those and had 8 steals. But defense was only half the story tonight as a offensive performance for the ages took center stage. Luke Hancock: “You can’t describe Russ’ game. That’s Russdiculous…Being able to play with a guy like that makes my job easier, and everyone better.” It’s one of those type performances that you tell your grandkids about someday when talking about the guy that wore number 2. For only the 5th time in the history of the Louisville Basketball program 40 points were scored by one player in a game, that player Russ Smith. Just when you think you’ve seen it all with this kid he comes out and drops 42 points on 14 of 22 shooting. It’s The third highest single-game scoring mark in the 100-year history of Louisville basketball. With his amazing performance tonight he is now one of just 8 Louisville players to score over 1,800 points, and moves into 5th All-time in scoring with 1837 points total. With 7 games to go this season he just has me asking what’s next? There are other guys who are quietly doing their part to make this Louisville team go. One of those guys is Stephan Van Treese who has 33 rebounds in his last three games. That includes three straight with at least 10. He has become a more confident guy and is playing like he expects to grab double digit boards. Mango has really started to look the part as well and he was one of the best defenders on the floor tonight with his 3 blocked shots. He also grabbed 6 boards. Chris Jones had 8 assist and 2 steals tonight to balance out the tremendous offensive effort from his backcourt partner. Great teams have a lot of things that make them great and one of those things is players on a team knowing what role they play. Every guy on this Louisville team knows exactly what their role is. Montrezl has been killing the rims in Memphis like he has been all season. The word Beast doesn’t do him justice sometimes. After tonight he now has 90 monster dunks and number 90 might have been his most impressive of the year. If I can be critical for just one second I am a bit concerned that the guys got out-rebounded 43-38 tonight. They were able to mask this tonight, but it is something that could haunt this team down the road. Ok enough of that! Our Cards are headed to another conference title game something very familiar to this group. It should be another great night for the Cardinals. 7 more to go. Go Cards!